This is one of the most common questions we get in the lead-up to a wedding or corporate event. We answer it briefly in our FAQ, but we’ll go into more detail here. Every one of our acts has a different footprint. We can always work with whatever space we’re given, however if the space is too small for our full setup our only option is to leave things out. This might be drums, or keys, or DJ controller and laptop, or lighting and effects. It might mean bringing a smaller, less powerful PA system. So knowing how much space you have to work with is important in order to get the best value for money when booking entertainment. We’ll start by covering our full range of setups. Suitable for background music (ie: wedding ceremonies), where power is unavailable or weather unpredictable. Space required: 1.5 x 1.5 metres. Setup time: 15 minutes. 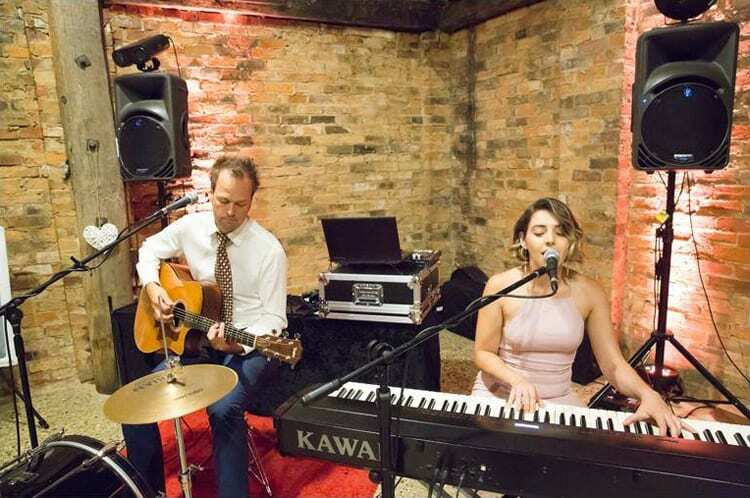 Suitable for background music at wedding ceremonies, dinners, and other low-key events, with our solo, duo, acoustic trio, and acoustic band lineups. Power is required. Can be set up outside if weather is fine. Not suitable for a dance party. Break music played on a tablet. Setup time: 1 hour. Soloist. Space required: 1.5 x 1.5 metres. Acoustic duo. 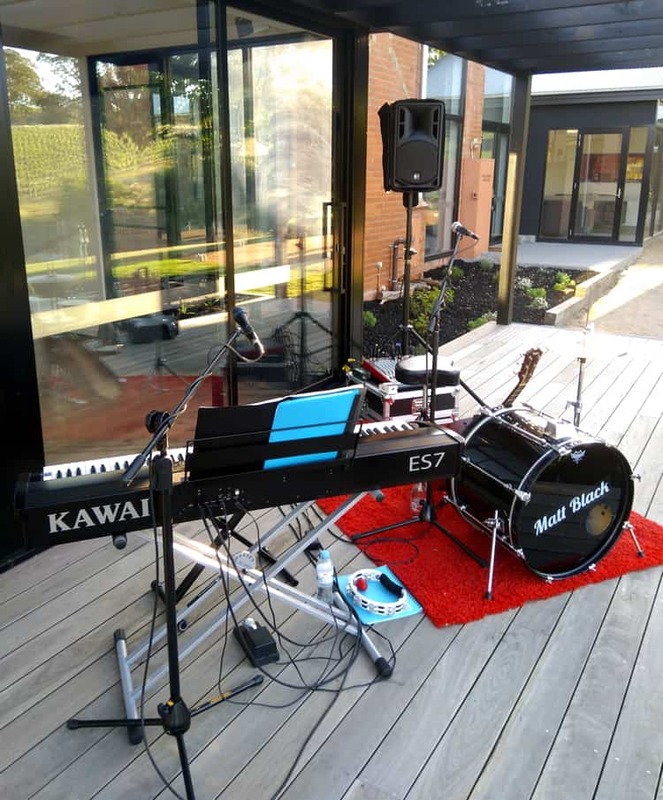 Space required: 2 x 3 metres with drums and keys; 1.5 x 2 metres without. 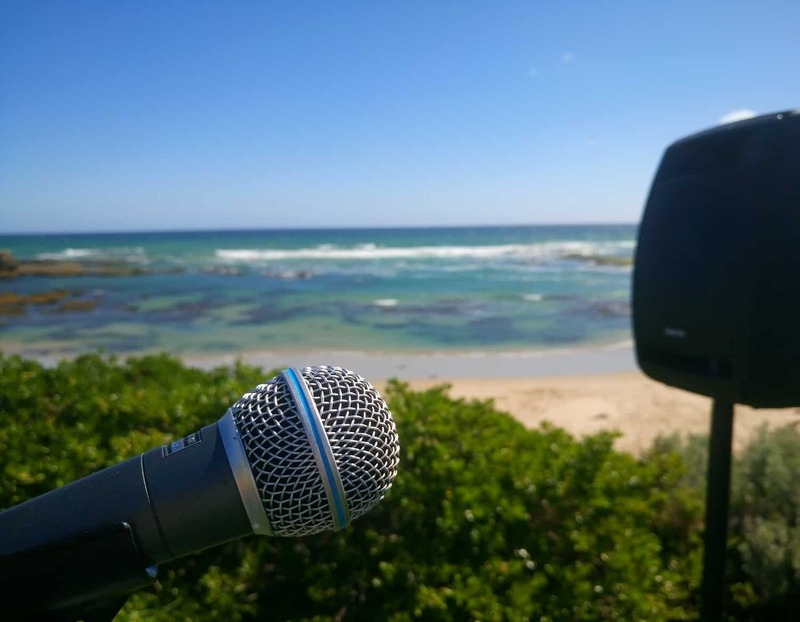 Our DJs can fit in a space as small as 3 x 1.5 metres. Due to their sensitive equipment they must be set up under adequate cover from both sun and rain though. Setup time: 1 hour. 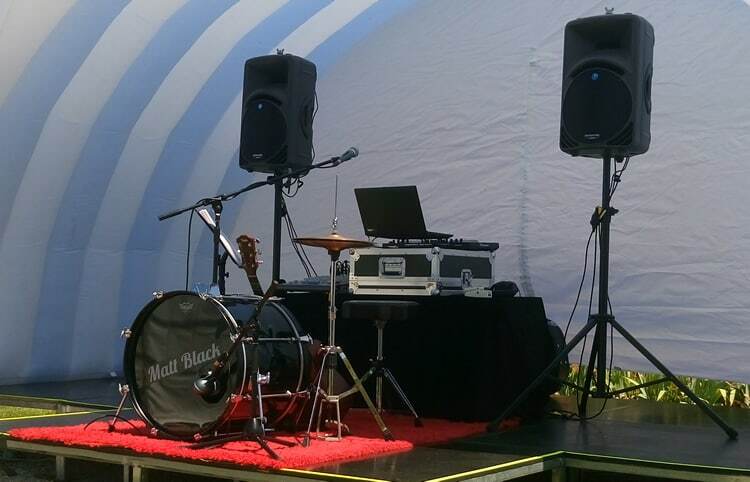 These are our typical configurations for events where we’re providing a combination of live acoustic music (solo, duo, trio, or acoustic band) and DJing. Must be set up under cover. Setup time: 2 hours. Solo + DJ. Photo shows 3 x 3 metres, but also works as 4 x 2. Lighting and fog machine not shown. Acoustic Duo + DJ. Can fit in a space of 3 x 3 or 4 x 2 metres. 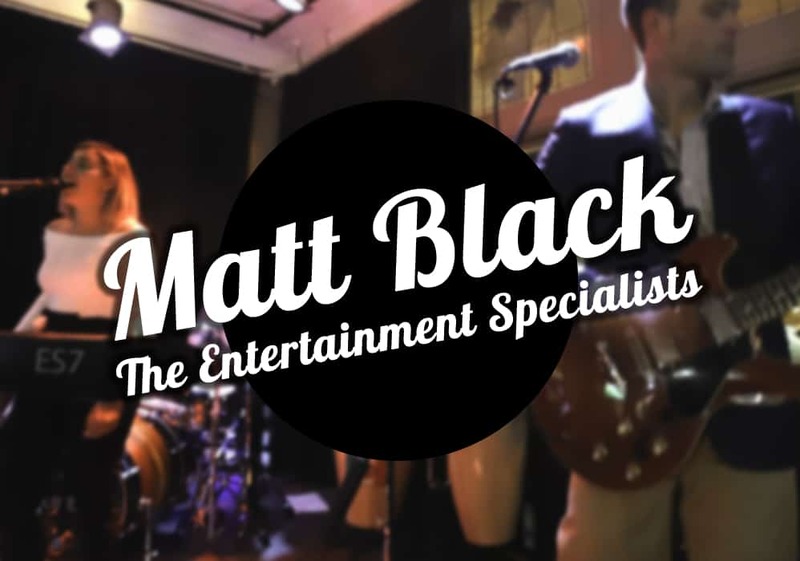 Our power trio and band lineups (up to 8 piece) require an (undercover) space of at least 5 x 3 metres. 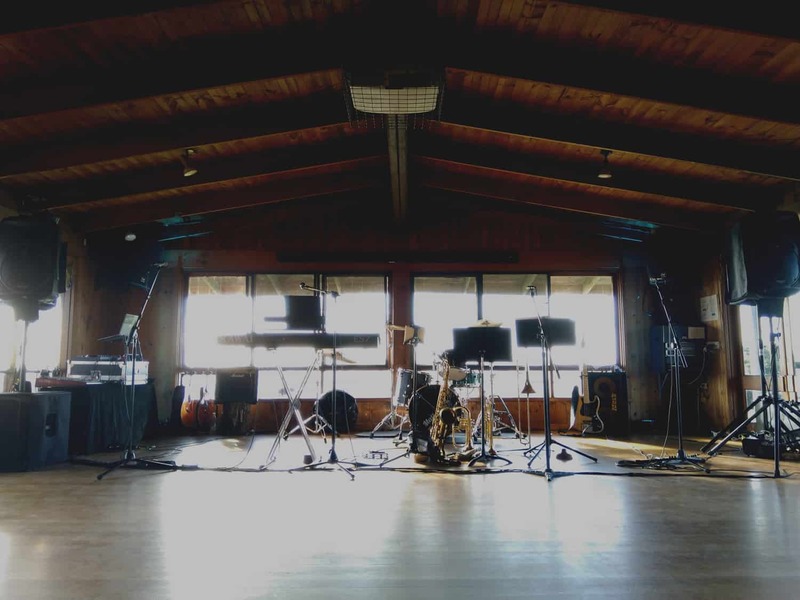 Below is a our largest setup: a recent 7 piece booking with live horn section and DJ. Of course the fewer performers the less space required. Setup time: 2.5 hours. A good venue will work with you to customise a floorplan to suit your event. Don’t be afraid to ask for what you want! If you’ve booked a smaller venue consider holding a cocktail-style event. Nearly all the space problems we witness are due to trying to fit too many tables in too small a room. If you are set on a sit-down reception consider hiring a larger room. Situate the performance space along a wall rather than in a corner if possible. Not only does it reduce the space required (a lot of space in a corner is unusable), it usually results in better acoustics, and enables a much more even coverage of the room with sound. Volume reduces over distance. 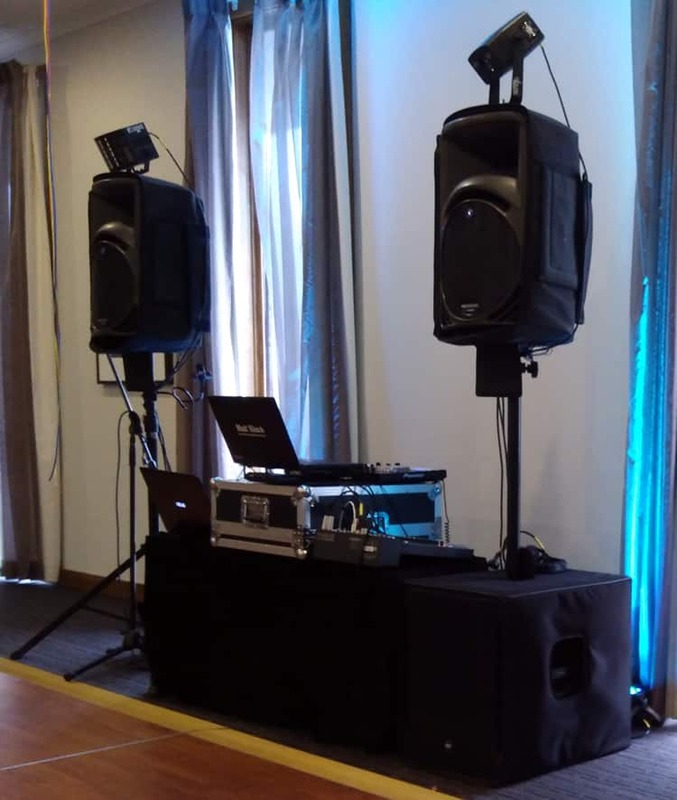 If you have a large room the DJ or band’s speakers are going to need to be fairly loud to throw sound to the end of it (particularly important for speeches). If you seat guests directly in front of the PA speakers either they will be deafened or the people at the back of the room won’t be able to hear. 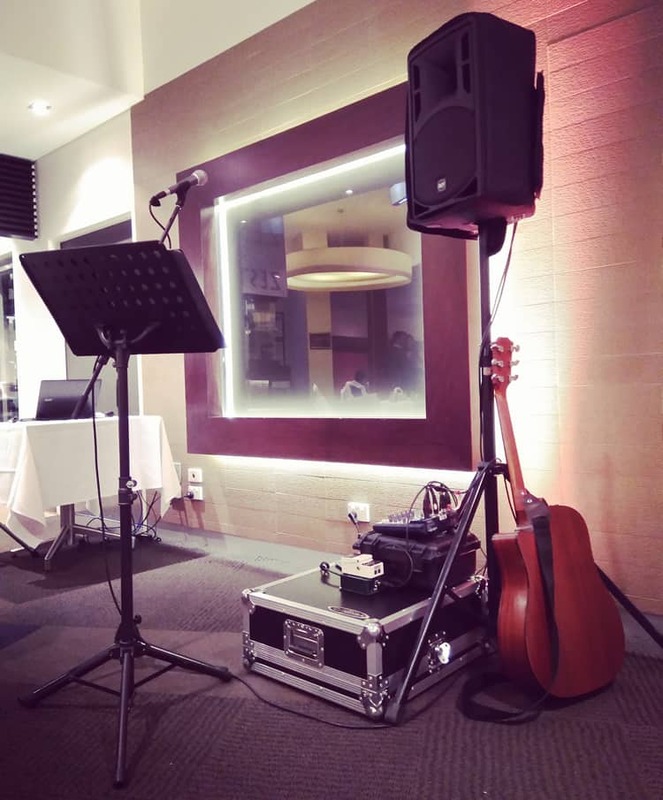 Your venue may have an in-house PA system, which will be suitable for speeches and (occasionally) DJing, but these are not suitable for live music. 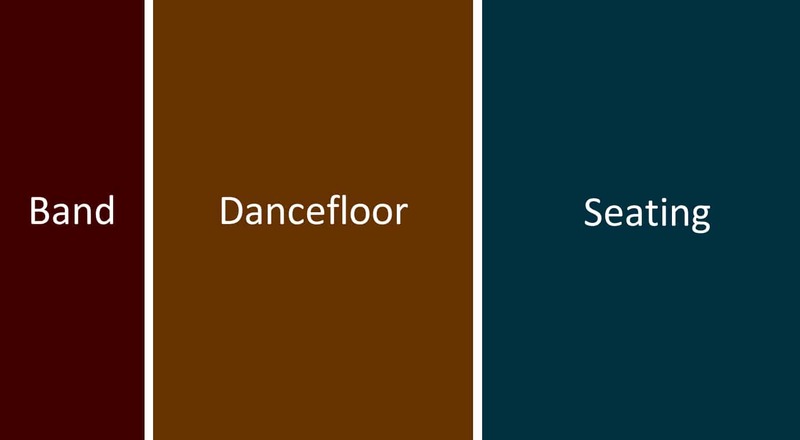 The best solution is to use the dance floor as a buffer between the PA system and your guests. It allows the PA system to be turned up to a practical level, enabling a more consistent listening experience wherever you are in the room. Further, having the dance floor directly in front of the PA enables a pumping sound in that area when you need it later in the night. Need more advice? 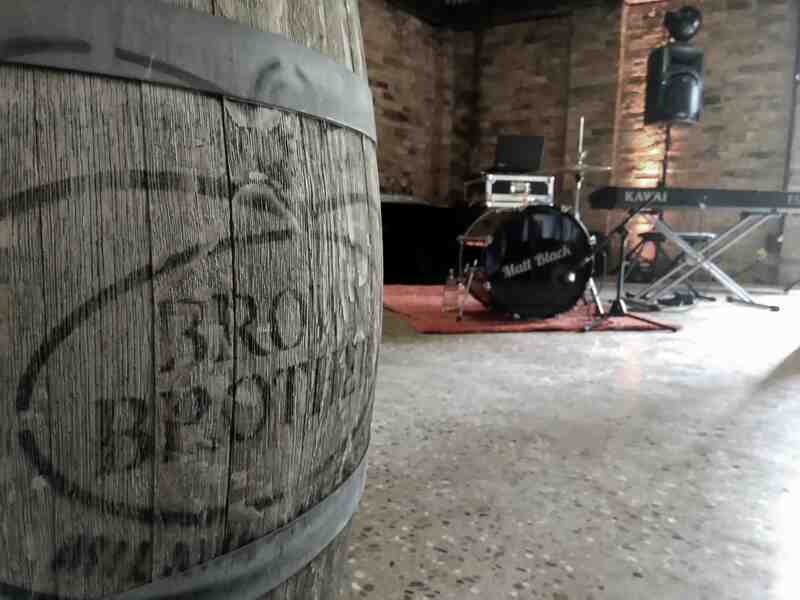 Contact us to chat about your event.